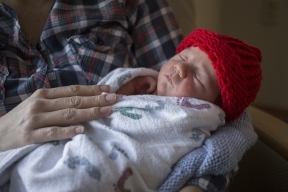 In the first year of Little Hats, Big Hearts Project, 300 hats were distributed to nine hospitals. The second year, volunteers from all 50 states and six countries donated more than 15,000 hats, which were distributed to nearly 20 hospitals in the Chicago area. 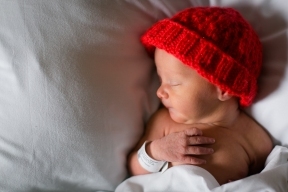 Now in the third year, Little Hats, Big Hearts has expanded to more than 300 hospitals across the country. “This truly is an amazing moment to see everyone come together for one issue which is heart disease and to see how this project is reaching more families each year,” said Schullo. 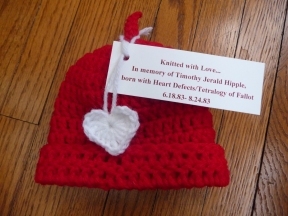 Last year, Cristina Newton received a hat for her daughter who was born with a heart defect. Newton, whose family has a history of heart disease, was optimistic in her daughter’s recovery. “Luckily, my daughter was born with a mild heart defect, although still scary, her doctors and nurses worked around the clock to help in my daughter’s recovery,” said Newton, who currently is pursuing a degree in Nursing at Oakton Community College. “Because heart disease is something that runs in my family it was a topic that was always discussed. I am so grateful for a program like Little Hats, Big Hearts that brings people together for an important cause.” This month, Newton’s daughter turns 1 year-old. If you would like to learn more about the program or to volunteer, visit www.heart.org. “We hope next year we are able to reach even more families across the country,” said Schullo. © 6527 Chicago Hispanic Newspaper, Lawndale News, Hispanic Bilingual Newspapers, Su Noticiero Bilingue. All rights reserved. XHTML / CSS Valid.